A former Cuesta College human resources analyst who was wanted on several failure to appear arrest warrants — in addition to charges of burglary and forgery — is facing an additional charge after she attempted to punch a Paso Robles Police officer on Monday afternoon. Around 1 p.m., Paso Robles Police officers responding to a tip found Lacey Fowler, 29, on the 100 block of Capital Hill Drive. Lacey then fled and a short chase ensued. After officers caught up with the former analyst, Fowler took a swing at an officer. Fowler missed and neither the officer nor Fowler were injured during the arrest, Sgt. Stephen Lampe said. Fowler is being held in the San Luis Obispo County Jail in lieu of $727,000 bail. In less than two months, Fowler has been arrested four times. She is facing six felony charges including burglary, forgery, possession of methamphetamine and cocaine packaged for sale and unlawfully accessing data. Fowler is also charged with multiple misdemeanors including battery on a spouse, violating a restraining order and resisting arrest. Fowler’s previous bail of $115,000 is forfeited, according to court records. Law enforcement began focusing on Fowler in late May after she allegedly breached the Cuesta College data system remotely and then emailed employee names, home addresses, email addresses, phone numbers and Social Security numbers to her private email account. When officers searched her home, they discovered more than four pounds of methamphetamine and heroin. On July 6, Lacey Fowler failed to show for a hearing on the charges of spousal abuse, failure to comply to a restraining order and unlawfully accessing data. The court issued an arrest warrant and set her bail at $227,000. 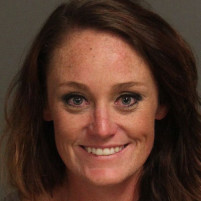 On July 7, Lacey Fowler allegedly burglarized a commercial vehicle and passed a forged check at the Paso Robles Walmart which led to the increase bail of $727,000. Don’t miss breaking news, like CCN on Facebook. This nut tried to hit a police officer, she should have gone to jail via the hospital..
No doubt it was a male officer that she tried to hit rather than a female. He probably thought it was funny (not that he let her know that). Had she tried to hit a female, I bet it would have been a different story and she would be sporting a black eye or worse in her latest mug shot. Please keep her locked up this time. Revoke bail. When she sobers up, get some counselling and get her ready for rehab. Lacy Fowler is a classic example of a career-criminal being aided and abetted by the government employee unions. The crazy ones are ALWAYS the best lovers. But, what a price to pay.